Something I just came around: This is from the Live! 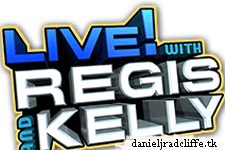 with Regis and Kelly episode which aired yesterday. Daniel has recorded a message for them. They celebrate their 10th anniversary this week, congratulations!